Marisol Vidal Martinez Hormigón concreto. Christa Kamleithner Atmosphere and Usage. Katja Friedrich Architecture easily to possess. Matthias Noell Abstraction in architecture. Stefan Hochstadt Thriving for contact. Michael Dürfeld Architectural concretion as a problem of form. The claim for material concreteness in architecture can be tracked back at least to the eighteenth century. In 1756, Francesco Algarotti cites his Venetian teacher Carlo Lodoli in the following way: “For which reason should stone not represent stone, wood not wood, each material itself and not another one?“ The following paper illuminates the background of this citation, as well as its adoption and further development by successive authors. Stations will be Gottfried Semper (“Brick should appear as brick, wood as wood, iron as iron”), Eugene Viollet-le-Duc, and Adolf Loos who postulates that no material “may claim for itself to the forms of another material.” Also, the Bauhaus model as taught by Laszlo Moholy-Nagy will be examined concerning the concreteness of materials. Finally, textual links will be established to Louis Kahn and Peter Zumthor, who thus appear in a historical tradition. The article compares different positions concerning the question of what can be understood as the concreteness of material. Concrete in itself is a nondescript pasty mass that only becomes a material with properties of its own through the control of its immanent potentials in the manufacturing process. For this reason, facing concrete is not a construction material in the proper meaning of the term, but rather a process that can be influenced by many technological, cultural, and design factors. The three-dimensional imprint of the formwork on the hardened surface corresponds to the technical truth of the design and thus reveals the traces of the production process, including those that are not to be shown to public. As this exhibitionist behaviour continues to reveal a close relationship between architecture and its means, even long after completion, facing concrete buildings are the ideal test tube for the analysis of concretion in architecture. Generally, Architecture is understood to be concrete, but why? The haptic is one of the most direct and sensuous perception and the basis for our concept of the concrete. Thus, the concrete may not only be perceived as the opposite of the abstract. Today the abstract becomes more and more important, as media and especially the internet influence our way of living and acting. The concrete sign vanishes and becomes virtually. Therefore, architecture seems to be the last realm of the concrete and the material. However, even in architecture both, the material and the concrete begin to hide behind video screens and adaptive facades. The article tries to examine the relation between the concrete the abstract and the haptic, as this seems to unveil the importance of the concrete in today’s architecture. The pictures and graphics common in architecture magazines are typically abstract; architecture is presented without any traces of its usage. This comprehension of architecture seems to be altered currently due to the discourse on atmosphere. An important reference point in this discourse is Gernot Böhme’s concept, which spans atmosphere between the perceiving subject and the perceived object. This concept enlarges aesthetic comprehension, but there are also some abstractions. For Böhme the direct bodily experience in released situations is the primary field of aesthetics – the mediality of perception, the aesthetics of usage, and the correlation of social and material parameters are disregarded and seen as not genuine aesthetic questions. In this paper, Böhme’s concept of atmosphere shall be discussed critically. I will contrast it with Walter Benjamin’s notions of distracted perception, habituation and usage. Such an enlarged aesthetics is less interested in the privileged situation of aesthetic enjoyment but more in the sensual and media construction of everyday life. Architecture is a field of research particularly appropriate for this new aesthetics. This shall be exemplarily shown through the works produced by the Austrian architect Ottokar Uhl between the 1960s and the 80s. 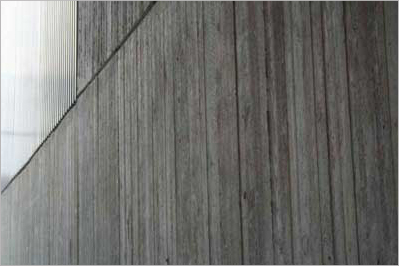 With texts and buildings Uhl has tempted to create something which could be called aesthetics of usage: For him the material of walls is as concrete and configurable as are the relations of human bodies, the temporal rhythms of use, the forms of communication, and the technical networks, which altogether form a concrete aesthetic situation. In this paper architecture is considered as lived and appropriated space. This perspective raises the question of the architectural requirements for self-determined living. In this context, the interpretation of a person's dwelling as his or her expanded body is of particular interest. Only the individual appropriation leads to an inner bond and thus the impression of safety, comfort and the feeling of being at home. Even an architecture that was designed and built for a variety of different kinds of appropriation remains a not yet fulfilled promise until people fill the building with life and show what it really affords. This paper looks at the perception and interpretation of urban voids (vacant lots, vacant commercial space, historic voids) from a semiotic point of view. According to dictionary definition gaps are interruptions in a pre-constructed ordered system. Similarly, the concrete gaps of the city can only be conceived ex negativo on the background of a certain urban order. For the observer, urban voids can be either spaces of disruption or spaces of possibility. Specific voids can obtain meaning either as transparent signs, which refer in an abstracting way to the past, the future, or to a cause-and-effect relation or as opaque surfaces whenever their concrete material substance is focused on. Oscillating between the transparent and the opaque, presence and absence, materiality and immateriality, concrete and abstract urban voids may break up fixed patterns of perception and provoke a different view of the city. Architecture and abstraction are rarely discussed within one context. The present contribution tries to compare some positions of architectural abstraction and abstract architecture in order to distinguish their different approaches. As an equivalent to abstraction in art, the different concepts of architectural abstraction are always to be seen in a relationship to mimetic processes. The essay outlines concepts of abstraction from the late 17th century to modern positions in art and architecture, when the role of colour in an architectural context was redefined in a rather radical manner. The argumentation aims to show how colour in a spatial context is able to balance the reduction of form. In-between colour shaping space in art and coloured architecture we can find an essential contribution to architectural abstraction. During the first third of the twentieth century European artists questioned the principle of representation. This can be seen as way of deliverance from the aesthetic crisis of the nineteenth century. The “intellectual” („geistigen“) aspects of art were stressed and no constraints by any determinism were accepted. What remains is the problem of the abstract and the concrete, whose meaning has changed. The correlation of concreteness and the abstract is a main theme in modern architecture. By reducing and concentrating materials, elements and forms to the very essential the functional organisation, logic order, and spatial structure should take specific appearance. Under the influence of the early 1930ies’ “Concrete Art“, particularly Max Bill has tried to develop a “Concrete Architecture“, where he intended a synthesis of structure and form with a concurrent focus on economy of means. In contemporary Swiss architecture this concept is augmented by factors of context, ”attractive“ materials and constructions (Herzog & de Meuron) and release of the ”Magic of the Real“ (Zumthor). The search for concreteness is interpreted as a potential reaction to the increasing force of virtual in today’s architecture. The concept of “concretism“ implies that the object considered as being “concrete” must have reached a particularly elevated level of substantial manifestation. Consequently, its use in architecture seems to be rather appropriate to designate the edificial and material realisation of a design or an idea. Yet equating edifices with concretism quickly reaches the limits of its analytic capacities. The empirical truth of an objective existence, being itself the result of the attempt to objectify a subject-related “perspective distortion”, is never free of reductions, attributions or appropriations. As empiric is thus defined a certain perception of an object, which has not been constituted individually but at least by parts of a society. Hence, the search for a comprehension of concretism goes beyond philosophical approaches and additionally includes sociological aspects. Presupposing the conception of architecture as one form of appearance of a social subsystem that is based on and established by communication, the paper addresses the question of to what extent system theory is capable to endorse the scientifically motivated and orientated analysis of architectural objectiveness and thus to emphasize the scientific character of architecture. Using abstraction the underlying text will try to approach the question for the concrete in the architecture. For this purpose the architecture is comprehended as a system replicating itself by the means of a three-figure selection: it is an autonomous correlation in whose environment are covered not only the constructions, but also the architects. Architectural concretion as a problem of form. There are many aspirants to concreteness in architecture, thus it is difficult to single out one special type of concreteness. Why is there such a great number of different observations on concreteness in architecture? This paper reacts to those observations not by defining concreteness in architecture but by discussing the question of how architecture becomes “concrete”. This requires a switch from a language suitable to describe phenomena to a functional language suitable to express generative mechanisms. This change has been performed in a consistent and forceful way within the framework of a theory of form in Niklas Luhmann’s system theory. This article presents a concept of designing starting from this perspective. This concept of designing allows for the description of the creation of architectural concreteness within the framework of system theory and for a differentiation of functional, constructive and artistic concretion. In 2004 when the ‘Iconic Turn’ became a focal point in cultural studies Gottfried Boehm joined in the discussion by proclaiming that pictures are characterized by a specific intrinsic logic. This logic, according to Boehm, was defined as “a consistent production of sense arising from genuine pictorial means”. Considering architecture’s fundamental relationship to its media based representations – sketch, plan, photograph, respectively its manifestation in graphical signs or symbols – it seems worthwhile to have a look at its images and their visual implications. Complying with Boehm’s idea of a ‘sense’ generated by the architectural image one might assume that a specific visualization of architecture could be able to communicate or even incorporate the central aspect, concept or idea of the displayed object, more significantly or basically than a certain building itself. In his text Der Loos-Gedanke Hermann Czech states that for Loos each building first of all is a “thought”. His battle against the ornament is a battle not for blank surfaces but against any form that is not based on a thought. The abstract thought is not transformed into an abstract form; each “thought” is developed into a special and concrete solution. In the definition of a special case, the quality of the established architecture lies in a conceptual abstraction in contrast to the aesthetic abstraction of blank surfaces as well as in a conceptual complexity in contrast to the aesthetic complexity of complex geometries. Thus, architecture is understood as a language that does not need to be reinvented but needs to be used precisely. The underlying article demonstrates how architectural concretion can be extracted from historic references. Further it will be shown how a direct, atmospheric, and performative presence can result from the use and advancement of principles and formal loans from historic constructions. The topic’s theoretic reflexion will be deepened and enhanced by using examples from the project Rokokorelevanz (Rococo-relevance). Thereby the authors represent the assumption that in case one does not admit a reference to history, by applying architectural concretion the potential resulting from using this historic reference for an architectural concept cannot be exploited. The editorial staff keeps all rights, including translation and photomechanical reproduction. if the editorial staff is informed.